Today was Tony's 10 day follow-up from this post. Short story, he ate rat poisoning, had to have his stomach pumped and be on medication (vitamin K) for 10 days.Wayne brought him back up to the Buffalo vet and they drew his blood. They called us the next day and said that his blood level was lower than what they like to see it, so they recommended him being on the medication for another 10 days and then bringing him in again. Wayne got them to call in the prescription into a vet in New Hope, so we wouldn't have to drive all the way up to Buffalo for the pills. That evening we had a baby class: Week 4 was about Cesarean Birth, Postpartum Care and we took a tour of the hospital. You can read all about it HERE. I met my good friend, Laura for dinner with her son, Ben, at Wild Bills in Maple Grove. I had never been there before and the food was VERY yummy!! I photographed a wedding in Belle Plaine for a friend. My Mom helped me that day. I am so thankful for her as I was 8 months pregnant. I couldn't have done it without her. Stay tuned for a more detailed post soon. It was baby shower day. Yay! My MIL, Kimmy, threw me a fabulous baby shower. Stay tuned for a more detailed post soon. I had my weekly Dr. appointment. You can read about it HERE. 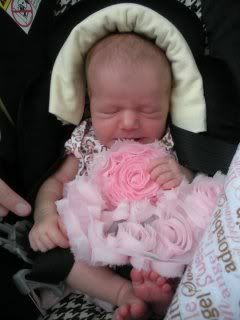 Baby class night: Week 5 was about caring for our newborn after birth. You can read all about it HERE. I had an engagement shoot with my friends Laura and Colin. They are getting married Memorial Day weekend 2012. Stay tuned for a more detailed post soon. Wayne and I spent the morning at Green Grandma's visiting with her before our maternity shoot with Jenny Hanson (our wedding photographer/friend). Stay tuned for a more detailed post soon. Tony had another Dr. appointment to check his blood. After about 20 days on Vitamin K pills he was all good to go. His blood levels were normal and he didn't need anymore medication. Yay! That evening we had our final baby class: Week 6 was all about Breastfeeding You can read all about it HERE. I went to the Rihanna concert with my friend Jeannine a/k/a Neener. After the concert we were able to attend the meet & greet. 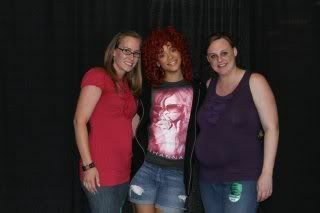 Here are a few pictures from the concert and our picture with RiRi. We had dinner at Toby Keiths with some friends of Wayne's. His buddy, Shane, is getting married in November, so it was a get to know you dinner with the soon to be new wife and some of the bridal party. 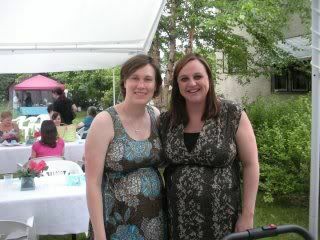 I got up in the morning and attended a bridal shower for Anne's (one of my best friends) sister, Kate. 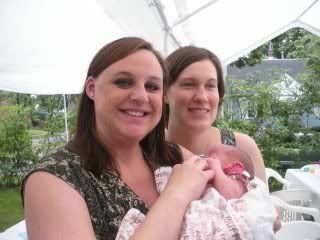 Anne had baby Ms. Ellie Anne 10 days before on 6/15. 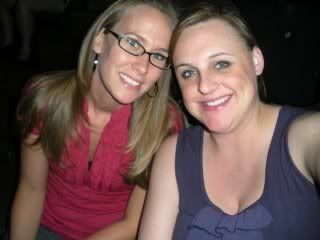 This is Anne and me the day before Hailey was born. The bridal shower was here in MN because this is where both Anne & Kate were raised, but Kate & her fiance, Andy, live in CA and that is where the wedding was on August 20th. I was unable to attend with being pregnant and having a newborn, but it went off without a hitch and I wish them both a lifetime of happiness. That evening I was picked up by my friend/co-worker, Nancy B., and my boss, Nancy M., and we went to see a play, The King & I, that our other friend/coworker, Krista K., choreographed.Overall it was a great night. We had all met for dinner beforehand with our other co-worker/friend Rhonda. Little did I know that Hailey was on her way. They all had an inkling. Hailey's Birthday which can be read about HERE. Our hospital stay which can be read about HERE and watched HERE. Stay tuned for the more detailed posts soon!